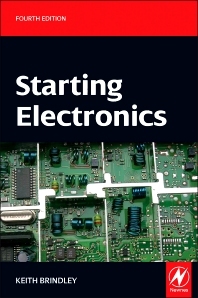 Starting Electronics is unrivalled as a highly practical introduction for technicians, non-electronic engineers, software engineers, students, and hobbyists. Keith Brindley introduces readers to the functions of the main component types, their uses, and the basic principles of building and designing electronic circuits. Breadboard layouts make this very much a ready-to-run book for the experimenter, and the use of readily available, inexpensive components makes this practical exploration of electronics easily accessible to all levels of engineer and hobbyist. Other books tell readers what to do, but sometimes fail to explain why – Brindley gives readers hands-on confidence in addition to real scientific knowledge, and insight into the principles as well as the practice. All written explanations and steps are supplemented with numerous photos, charts, tables and graphs. Concepts and practical aspects are explained thoroughly with mathematical formulae and technical schematic drawings. Each chapter introduces a concept or tool, explains the basic theory, and provides clear instructions for a simple experiment to apply the concept or tool, with quiz sections and answers, at the end of each chapter. New chapters on multimeters and soldering will be added, covering the fundamentals and experiments, with a basic parts list and an expanded and updated buyer’s guide.